← Eat, Fast and Live Longer. A 5-2 Fast Day Recipe Idea Under 200 Calories.Warm Fennel Salad With Lemon, Parmesan and Herbs. 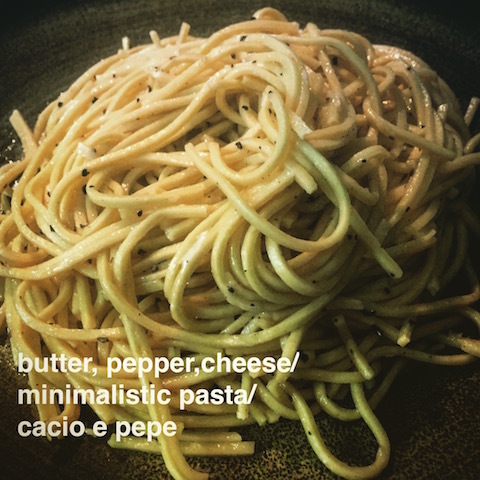 This entry was posted in Pasta, What I Love to Cook and tagged Butter, Cheese, Italian, Made From Scratch, Pepper, Spaghetti, Winter. Bookmark the permalink. 4 Responses to The Original Mac ‘n’ Cheese. A Roman Classic. Cacio e Pepe. My daughter will love this, I will have to add it to our recipe rotation. It’s already a firm favourite on ours – not only because it tastes great but its a no brainer to prepare.Sometimes I crisp up a little pancetta or prosciutto in the oven while the pasta is cooking and crumble it over the top. I made this this evening as an indulgent supper for one (I did divide the recipe by 4!) with a glass of red wine. I thought about a healthy green salad but just enjoyed the pasta (ribbons as I didn’t have spaghetti) as it was! Thank you – the best “mac ‘n’ cheese I have ever had! It is a great little recipe isn’t it? Thanks for trying it and may I say this must be the fastest (known) turnaround on anyone cooking from my blog – the post has been up for less than 24 hours. Now that’s something that makes me smile.